If you just can’t wait to grab some friends and take a stand against an inevitable apocalypse, this is set to be a terrific weekend for you. Fatshark have announced that the beta for Warhammer: Vermintide 2 will roll out on Steam starting nowish. Find out everything we know about Warhammer: Vermintide 2. Officially, the beta begins at 9:00 PT / 12:00 ET / 17:00 GMT, or just a few minutes from the time of this post. It is closed, but you should still have time to sign up for a key at the official site. All pre-orders will also have access to the beta. According to a new dev diary accompanying the beta, this test will feature one of the game’s levels and five careers – one for each hero. This will also mark the end of the last NDA according to the official Discord server, so even if you’re not able to play you will be seeing plenty of gameplay footage and impressions. 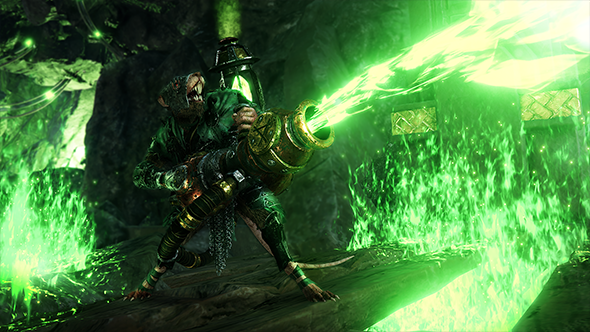 Warhammer: Vermintide 2 brings the combined might of Skaven and Chaos hordes against you on March 8.